It'll tell you when it's time for a replacement. As people get more concerned about the air they're breathing, so the case for buying a smart air purifier becomes more pressing. That's what has prompted 3M to build the Filtrete Bluetooth-enabled residential air filter, which lets you know when it's time for a change. The idea being that the filter itself can alert you — via an app for your smartphone — when it's time to run to the store and buy a $30-ish replacement. The filter itself is available in a variety of shapes and sizes, but with a wee bump nestled on the front, which houses the Bluetooth radio and sensors. The system doesn't just act as a prompt for spending more money; it can also offer up real-time data on the air you're breathing. At least, that's something you can do if you spend more cash on a compatible air-quality monitor, although that's likely to come with its own app. The platform can also offer up helpful hints on how better to improve your indoor air quality and life. The EPA recommends you change your air filter once a month, but 3M's data suggests that most folks string theirs out for up to three months at a time. But that doesn't take into account the variable air quality that'll be different in every home and location, or your particular usage pattern. By using a machine that can alert you when your filter begins to degrade, you might wind up avoiding the problems inherent with breathing dirty air. 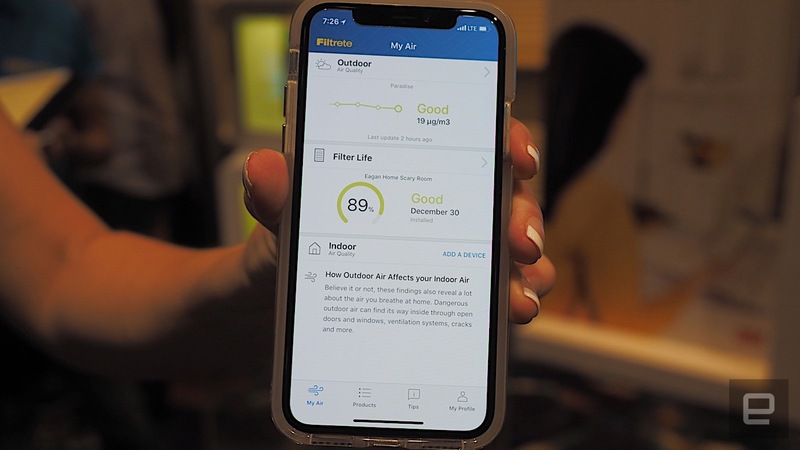 The 3M Filtrete Smart Air Filter will be available for purchase in the spring for a price that has yet — as with so many things at CES — to be determined.